Yep, so far, it really is everything we expected. The Saturday morning line wasn't that long, and the people in line were interesting to meet. It's small. Smaller than my iPod, smaller than my Treo. Typing seems pretty good. I never could remember where some of the punctuation keys were on my Treo; I like the big, bright keyspots. Activation through iTunes was brilliant. It means the Apple Store people can be incredibly efficient: maybe 90 seconds per customer. If you work out the cash flows, it's impressive — movie money, except this one should have legs. It was easy to keep my cell phone number. I was prepared to switch numbers, but that turned out to be trivial. The Web browser seems surprisingly good. In the NY Times, Virginia Heffernan discusses (and favorably reviews) a hypervideo mystery, Satacracy 88. Now that 14 episodes have been produced and eight plot twists voted on (more episodes and votes are on the way), “Satacracy 88” features a ghostly character who doesn’t appear on screen: the audience. It’s a small but loyal group. A good episode receives about 10,000 views, and votes can draw up to 1,000 participants. Still, trying retroactively to understand the voters — Are they on Angela’s side? Why do they hate her boyfriend? Will they always want more gore? — is now part of the intrigue. One cavil: we please stop obsessing about box office and just let the new art find its audience and be itself? My goodness! Michael Tolliver, our old friend Mouse, is 55. Tales of the City and Angels in America truly did move the bar. That change has been obscured by the Bush years and the talk radio Christianist vitriol, but it's a real and lasting change. (Stonewall was 38 years ago this week. Jackie Robinson’s rookie season and the Integration of the Army both happened in 1948; by 1986, 38 years later, Andrew Young was mayor of Atlanta and, even in the deepest corners of the deep south, racist vitriol had been stuffed into the closet.) The Massachusetts legislature couldn't even muster a 25% vote to authorize a referendum on gay marriage; the center hasn’t moved far enough, but it has moved. What did happen to Mary Ann Singleton? Or, rather, what did Maupin mean when he let her, obsessed with her career and her schemes, fly off to New York unmissed and unmourned? I suppose she symbolizes Cleveland’s involvement with that city by the Bay, and then sense that Cleveland no longer wanted anything to do with San Francisco. Michael Tolliver Lives celebrates the first signs of reconciliation. Aaron Swartz lists the Books I Recommend Without Reservation: 2006. I read over a hundred and twenty books in 2006. Some of them were OK. Some were good. Some were very good. Here are the handful that I can recommend you read without any reservations. One of the first books on his list, Hardy’s A Mathematicians Apology , was the subject of my college admissions essay and a book I used to adore. Which reminds me: in the year I was applying to college, I kept a list of books I read. Wish I knew where that list has gone. Digital preservationists take note. The iPhone is the floating car we imagined we'd be driving in the future. The Jetsons, Star Wars, Blade Runner, Minority Report ...the iPhone is that touchscreen gadget they all used (metaphorically speaking) to communicate with...... and like any good science fiction movie - it's about the theatrics. The experience. The motion. The transitions. The atmosphere. What the iPhone does is as important as how it does it. But we're a future-hungry generation and the future is late in arriving. Damn it, I want my jet pack. I signed up for the Farm School's Community-Supported Agriculture program. What this means is that I send them a check and now, every week I stop by the local artisan baker and take a big box of fresh vegetables and fruits out of their cooler. This amusing challenge seemed like a nice idea, especially since Linda's been lobbying for more vegetables. And there's something exotic and foodie-ish about being expected to Cook What's In The Box, rather than stopping by the Museum of Fruits and Vegetables to select what you feel like cooking. Box #1, for example, had young snap peas (which I ruined by trying the shell them) and three kinds of lettuce and fresh native strawberries and lovely spring onions (red spring onions: I've never even seen them before) and two big bunches of radishes of various colors. I knew there would be radishes. If radishes were edible, second graders would solve world hunger. I put them in salads. I sautéed them, then doused them with lovely dark veal stock and reduced and reduced. I put them on sesame crackers with butter and smoked paprika and fleur de sel. I still have one left. But then there are the things that you don't know how to cook, and the other things that you don't know what they are. Rutabaga: what do you do with rutabaga? (Turning back the clock to college, I took counsel with The Joy of Cooking, and very good counsel it was.) Meryl got the broccoli rabe right. Another mystery bunch, I eventually decided, might be collard greens. I cooked them as if they were collard greens (wild boar bacon, then 20 minutes boiling in a little water, splash with vinegar), and they were nice. But where are their little collars? Yesterday, Reuters ran a story by Franklin Paul about the imminent flop of the iPhone, featuring a prominent critique by David Platt, described as a computer science professor at Harvard University. Yes, there's a lot of iPhone hype. But this pseudo-reporting is absurd. Nobody knows how people will like the iPhone. Nobody. When Steve Jobs came back to Apple and announced the iMac, we laughed: who would want a bright blue VT-100? Who indeed! Two months later, you could tell which art galleries in Santa Fe were doing well because all the thriving galleries had bright blue iMacs sitting on their 18th century Spanish-American tables. And I thought the iPod was a silly little peripheral that would cleverly lead a few people to buy Macs because they owned an Apple product and nothing terrible had happened. The popular tech press is corrupt. All this week's iPhone coverage is merely a battle of people trying to spin their past job performance or grab some extra attention. You can't study a device this complex quickly; we'll all need days or weeks to figure out what it can and can't do. 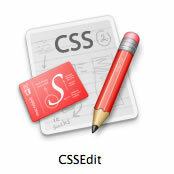 It seemed a little silly to grab a specialized editor for CSS; it's not that big a language, after all. But CSSEdit 2.5.2 from macrabbit in Belgium has convinced me. Fast syntax checking, sane validation with (intermittently) sensible error messages, and fast syntax-directed editing make it a pleasure to use. Just $29.95. Gertrude Bell (1868-1926) is the woman who invented Iraq, the one person most responsible for seeing that the Ottoman vilayets of Mosul, Baghdad, and Basra should make up a separate, united country. A wealthy and erudite Englishwoman of formidable learning and accomplishment, she took a First in Modern History from St. Margaret's Hall, scaled Alpine summits (in her underwear) that had seldom before been climbed (and never by a woman), spoke flawless Arabic, conducted competent excavations, taught T. E. Lawrence to make maps and greet sheiks, and brooked no nonsense. One morning, as she was breakfasting with Haji Naji in his summer house, a dervish strode in with an iron staff and rudely demanded to be treated as a guest. Haji Naji told him to go. Looking threateningly at Gertrude, he said that he had as much right as she to be there. He then sat down in the entrance and declared, ‘I rely only on God,’ and began to read in a loud voice from the Koran. Neither Haji Naji, his son, nor his servants, could move him, so Gertrude told the dervish, ‘God’s a long way off and the police are very near,’ snatched up his iron staff, and struck him with it. He left. If this wonderfully rich and readable biography has a flaw, it lies in passing too lightly over Bell's political thinking. She was, with Lawrence, a champion of the Arab cause, but we learn little of her thinking on imperialism or, for that matter, on insurrection. She was indefatigable in defense of Arabs but did not care at all for Zionism. She worked hard to play an important role in spheres hitherto closed to women, but opposed suffrage. Indeed, her opposition to suffrage seems to have contributed largely to the decline of her reputation, and it would be interesting to hear her out and to learn what she was thinking. Bell seems always to have viewed the creation of Iraq as a goal and a triumph, and it is not entirely clear from the biography exactly why she worked so hard to glue the Kurdish North to the Shiite South, or whether her dismissal of Shiite leadership was grounded in necessity or illusion. In the New Yorker, Anthony Lane has some fun with Nancy Drew. His Drew review is a dialog between Emma Roberts, who plays Ms. Drew, and her Aunt Julia. Aunt Julia smiled, something she seldom did in public for less than twenty million dollars. Nancy has been telling Aunt Julia all about her new movie. “It was splendid,” replied Emma, pausing to adjust the headband on her fine reddish hair. “The story begins in River Heights, a town full of delightful white people. I am motherless and my father is a lawyer, so both of us are rather sad! For a treat we move to Los Angeles, where the girls at my new school say I remind them of Martha Stewart. She's moving into a big house that used to be owned by an actress. The only 21st century film in AFI's list of the top 100 films of all time is, curiously, The Fellowship of the Ring. But I can live with that. Candler was quoting me, and I cannot agree more. Ebert on "My Fair Lady"
This morning, the Verizon DSL tech reports that he's seeing Forward Error Corrections at the Far End. So he thinks the problem is our router, or maybe our Airport. Or maybe the problem is having Macs and PCs on the same network: he thinks that's bound to be chancy. He won't say he knows Macs can't be on a network with Windows machines; that would be succeptible to disproof. He just speculates that "maybe that could be a factor. I don't know. Or maybe the filter on our fax machine has worn out. And he says the real problem is that our wire is 26 gauge, and it ought to be 24 gauge. I despise this. Are other DSL vendors in Boston merely Verizon repackagers? Eastgate's Verizon DSL has been intermittent again today. By early afternoon, I shrugged and called tech support. It took 57 minutes with support guy 68919. Eventually, the line came back — perhaps something we fixed, or perhaps it just fixed itself. 68919 tried to blame our Netgear 314 router: was it old? Surely that was the reason we couldn't acquire an IP address from Verizon! And when this intermittent failure happens next, what should I do? Start over! It might only take 57 minutes next time. (The previous time this happened, it took almost of week of almost full-time effort on my end to get the problem fixed) Can we do anything to get at the root of the problem? No. Is there any reason to think that our Netgear router is more culpable than the line, or whatever gear Verizon has on the other end of the line. No. Can 68919 explain? No. We're now buying two Internet connections from two different companies simply to get one connection we can trust. Dave Winer just did the same thing. This is nice for the internet providers short term, but it's going to hurt them in the long run: it's a huge opportunity to destroy existing business relationships (we've been Verizon customers since their ancestor, NYNYEX, was created) and create new ones. Time flies. Nelson invented hypertext, and so has reshaped the intellectual and technical bound of our age. 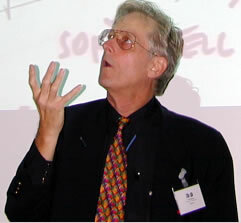 He gave an early birthday lecture at the University of Southampton titled Intertwingularity: When Ideas Collide. Better still, you can download the lecture as a podcast! The last time I tried to cook a beef brisket was for a brunch, maybe ten years ago. But Cook's had a fresh article, and Savenor’s was willing to sell me a flat-cut of brisket even though it wasn't the season (when is brisket season>), and away we went. (If you know the proper name of my gratin, or know where that guide to the potato has gone, please do Email me.. Recently, City of Heroes introduced some new game elements. Your hero can confiscate stuff from the bad guys you arrest. Sometimes it's debris, sometimes it's recipes for converting debris into (mildly) useful stuff to improve your superpowers. There's a chain of auction houses that let you buy and sell the stuff. It's all a game mechanics correction: there's a lot of money influence sitting around in the game with nothing to spend it on, so the developers are trying to find ways to get the economy going. But that doesn't stop people from working hard to create stories that explain these mechanical changes in terms of the story world. Not the developers, but the players. For example, one player pointed out that the whole idea of spending influence to buy power enhancements is silly. (In D&D you get gold pieces, in City of Heroes you get influence. Everyone knows that influence is gold, painted silver.) Why do you need to spend anything? Isn't it like exercise: you do good things, you get better at what you do. "Not at all!" another player explained. "You find a recipe for improving your x-ray vision. It takes some weird stuff that you can get because you're a superhero. It probably also takes a bunch of other stuff that you spend all day running around to hardware stores and whatnot to pull together. That's why you have to hunt for, or buy, all this salvage. And then, when you do all this work and get even better super powers, what happens? You're even more superheroic, and that means you're a little bit less human. All those people who love you because you Protect The City from the bad guys are going to look at you again and see again how strange and scary you are." And that's why buying better power enhancements costs influence. This kind of storytelling is, I think, a new thing. You could always speculate about the past or future of a fictional world. You could always say, "I think Little Nell is going to get well." But here, the players are explaining the story to the authors and to the other players. Over the past few years, I've read a lot of papers and heard a lot of talk about preserving electronic literature. We've had lots of proposals that everyone should write in XML, or xHTML, or HyperCard, or acid-free bits. Or paper. We've had fund raisers and institutions and panels and conferences. What has it gotten us? How, exactly, are we better off? I think, maybe, we'd all have done better advised to spend our time to writing great stuff — and writing about great stuff — and to let Time take care of itself. Time will do that, whatever we do. Moved earth and heaven; that which we are, we are. Guy Kawasaki and Doug Lawrence present fifteen useful guides to speaking well. There was a Tinderbox Breakfast in Cupertino last week, and I didn't even know about it. What fun! 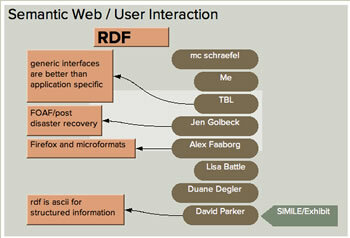 I spent a delightful morning with the Semantic Web/User Interaction workshop, a bicontinental meeting held simultaneously today in Cambridge and Zürich. Tons of fun, and some great ideas. Tim Berners-Lee threw out the observation in passing that "bidirectional links inevitably lead to numerous meetings." This is a critical observation about hypertext: if you're responsible for both ends of the link, you need to maintain relations with the people at the other end. On the Web, you aren't responsible for your inbound links, so you don't need to meet everyone who points to you. Here are my Tinderbox notes from the first few minutes in Boston. Yes, that's Tinderbox. Exciting things are afoot. Mike Daisey is a brilliant comic actor who does one-man performances on a bare stage, equipped with a desk, a chair, a glass of water, and an outline. This book describes how he came to have this occupation, rather than his previous employment in the customer service department of Amazon.com. It's a pleasant memoir, although we know from the start, roughly, where this is going to end. There's a terrific novel trying to escape from the confines of reality. But you knew that. The memoir is fun, and Daisey is a very fine storyteller, and when it all winds up in a café in Madrid with his fiancée (and now director) Jean-Michel as they sip their third beer of the morning, we really do understand the hero's journey sometimes involves lots of meetings and free office supplies. A TED demonstration of a very impressive pan-and-zoom interface. PAD++, all grown up, Thanks, George Landow!